Synopsis: A ballet dancer wins the lead in Swan Lake and is perfect for the role of the delicate White Swan – Princess Odette – but slowly loses her mind as she becomes more and more like Odile, the Black Swan. Did You Know? Having only ever casually practiced ballet as a child, Mila Kunis practiced with a ballet instructor for over three months for her role. Natalie Portman trained for a year to prepare for the role and paid for the training out of her own pocket until the film found investors. Quotables: THOMAS: The only person standing in your way is you. It’s time to let her go. Lose yourself. 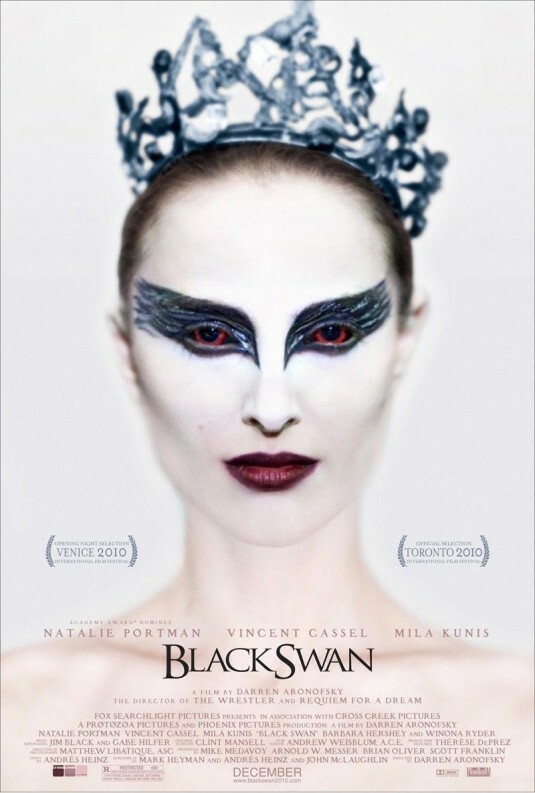 Black Swan is a visionary psychological thriller. It is captivating from the very start, provocative through to the very end. Natalie Portman’s haunting execution of Nina’s transformation from the timid and reserved dancer into the confident and seductive ballerina is flawless. Mila Kunis is excellent as the seemingly unassuming newcomer. Vincent Cassel perfectly oozes sleaze. And Barbara Hershey is chilling.